A terrorist who heroically murdered a teenage girl. On June 11, 2002, a Palestinian suicide terrorist walked into a restaurant in the Tel Aviv suburb of Herzliya, and detonated a bomb that killed a girl, 15-year-old Hadar Hershkovitz, and injured 16 others. 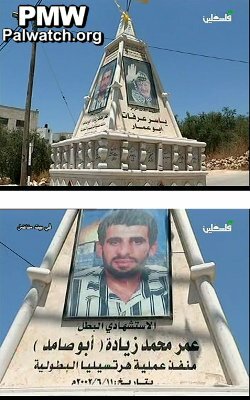 The town square in the West Bank town of Madama where the terrorist lived features a monument honoring "the heroic Martyrdom-Seeker" and his "heroic Herzliya operation." The monument has pictures of the suicide terrorist and of Yasser Arafat. This coming Tuesday, Hadar Hershkowitz, 15, was to have sung and danced at her middle school graduation in a special performance of fairy tales created by the students. Instead, friends and family members yesterday heaped her fresh grave with flowers and crowded into the Herzliya Cemetery only a few short blocks from her home to say goodbye. Hershkowitz was killed by a suicide bomber while walking with a friend outside Jamil's shwarma grill on Rehov Sokolow. A friend, also a student at Ze'ev Jabotinsky Middle School in Herzliya, was seriously wounded in the attack. Despite the hot sun, friends stayed in a tight circle around her grave and lit yahrzeit candles. I'm sure that there are outraged protests at that square every day by residents of Madama who are incensed that such a person is being honored in their town. I'm sure that there have been many op-eds in the Palestinian Arabic media denouncing this honor. I'm sure that President Abbas is working to ensure that this never happens again and that he will personally apologize to the family of Hadar Hershkovitz. Because that is how decent human beings would act. And we all know that everyday, average Palestinian Arabs are just like everyone else, and would naturally find the existence of this square to be an affront to everything they hold dear. They are the peace partners, after all. They wouldn't call a person whose entire existence is defined by his murdering a 15-year old girl at a shwarma shop a hero. That would be unspeakably horrific. The square, which has been up since at least May, is surely an anomaly, a mere mistake and will be dismantled any day now. In fact it is difficult to even imagine that people designed and built it, that a town approved it, and that people pass it by every day without any hint of outrage. Or, at the very least, I'm sure I can find a single person protesting it. A single Arabic op-ed. Something.